It is important that all organizations interact appropriately with people with disabilities, whether they are employees, contractors, vendors, or customers. This is not only required by law, it’s the right thing to do. And as the population ages, the number of people with disabilities in the workforce will continue to increase. Currently over 15% of the worldwide population has some type of disability. Section 503 of the US Department of Labor, along with the Americans with Disabilities Act of 1990 (ADA), provide laws and guidelines, but they do not give employers the detailed information they need to provide a truly inclusive workplace. 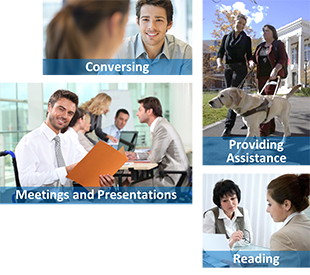 Freedom Scientific’s Disability Etiquette course teaches your employees how to interact with people with disabilities, and helps you successfully integrate people with disabilities into your organization. This fun and informative course teaches strategies to use while recruiting, interviewing, and setting up environments for people with disabilities. It also covers best practices for interacting with contractors, vendors, and customers. Contact us to find out how to make Disability Etiquette part of your HR portal and part of basic employee awareness training. We can help support your organization’s risk management policies, as well as your efforts to optimize an inclusive and diverse company culture.